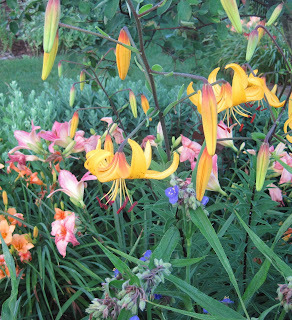 Blog posts are sometimes like the blooms of a flower, here today, gone tomorrow, replaced by another post. Perhaps the blog post is remembered, or perhaps it is best forgotten, almost a weed. As I approach another milestone in blogging... post number one thousand five hundred, expected to be posted sometime before the end of July, I've decided to copy a few of my favorite posts, or series of posts, into the new static pages offered by Blogger. A few weeks ago, I made a static page for my hoe collection. Today, I've added a second one to feature my Five Secrets to Achieving Happiness in Your Garden, along with the details of how I learned these secrets. Next up will be the obligatory "About Me" page. I think I've got some explaining to do regarding my therapist Dr. Hortfreud, Hortense Hoelove (just who is she? ), the Society, SGAFO, GADS, etc. And maybe some of it will be true! If you have any questions you'd like me to answer in "About Me", please let me know. In the meantime, I hope you enjoy the Five Secrets to Achieving Happiness in Your Garden. Someday soon I'm going to get pages set up on my blog ... I like yours! Koodos on acheiving that benchmark!! I have added you to my "new" housewife post today because your tips are always amazing. I love that picture. The colors and forms are so beautiful. wow - hadn't found out about the static pages before. But congrats on the enormous number of posts - I'm struggling towards 300 and that's hard enough. Thanks for adding the pages -- I love that the five secrets are all together. Congratulations on your approaching 1500 milestone!